Established in 1937 by the late Capt. Ernal Foster, the Albatross Fleet has fished every season since then except for the years of WW II. The fleet is now operated by Capt Ernie Foster who, having learned from his father, is one of only three second-generation native guides operating out of Hatteras. Moored at Foster’s Quay in the heart of the harbor of Hatteras Village, the fleet has its own private docks and fish cleaning facilities. The Albatross Fleet provides its customers the convenience of a marina operation with a sense of privacy and a personal touch not usually encountered in the modern world of salt-water fishing. 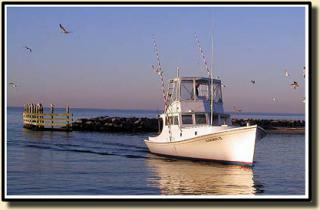 The three boats of the Albatross Fleet were built specifically for fishing the waters off Hatteras. They are sturdy, have stood the test of time, are “sea kindly” and are equally at home in the shallows of Hatteras Inlet or Cape Point as well as the Gulf Stream.